Breakfast may be the most important meal of the day according to nutrition experts and doctors, but let’s face it, most of us simply don’t have enough time to have a proper morning meal. Most of the time, we just gobble down a bowl of cereal, a snack bar or a large coffee. The full English breakfast is a thing of the past and few have the time and means of having one every morning. Avocado is the wonder fruit from the New World. Rich in fats and protein, plus a plethora of vitamins, avocados can stave off hunger for hours, while also giving you the much required energy boost. Ideal for a savory brunch or a light snack, the Mediterranean avocado toast is easy to make and is a healthy alternative to the more common chocolate bar. The creamy avocado blends greatly with the crusty toast, the juicy lemons, and the savory feta cheese. Sprinkle some salt or pepper on top and you’re ready to go. Just a few slices and lunch will seem so much closer. Almonds, brazil nuts, walnuts, and cashew are your best friends for the 11.00 a.m. snack. Just by eating a 2-ounce portion of nuts you will get more than 50 percent of your required micronutrients (most vitamins, magnesium, calcium and zinc). 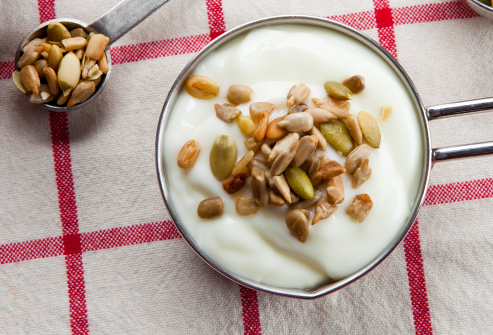 What’s more, if you add a little yogurt on the side, you will get a refreshing, energetic mix that will help you get to lunchtime without feeling hungry. If you feel that naked nuts are a little boring, you can try to have them as spicy roasted, glazed in cinnamon or with firecracker flavors (a combination of chili, garlic and ginger mix). Bruschetta is a type of Italian snack that is eaten mainly during morning, as breakfast or as brunch, just before lunch. There are many varieties of bruschetta, but this recipe is truly a blessing, blending the sweetness of figs with the saltiness of the prosciutto and the sour flavor of Italian cheese. You can quickly make yourself a brunch that will keep you refreshed throughout the morning. Just sprinkle on top a little salt, pepper and honey, to add a little extra flavor. It’s light, easy to make and will leave you asking for more! You won’t regret it! Oatmeal is hugely popular in the United States and it’s no wonder. It has all the main nutrients, protein, carbs and fat, it is easy to make and very versatile. This recipe combines the zesty ginger with the juicy, sweet pineapple with the basic oatmeal, giving a filling meal that will stave off that pre-lunch hunger. You can add milk to make it a little more appetizing, but you can also use any type of fruit juice, as long as it goes with the ginger. It’s easy to make, it tastes great and will help your craving for that delicsous food at your favorite restaurant, like those at Kasa,. Flaviu Mircea is freelance writer, specializing in food related topics, and is always seraching for new meal ideas. If you would like to learn more about Flaviu, you can visist his Google+ profile.